Art and artifacts adopted in the fall of 2014 on display in the second floor galleries. Books and artwork that have not been on display at Ellarslie, the Trenton City Museum, due to their condition or ability to be presented, are on display, some for the first time, through September 13, 2015. The exhibit honors the friends of the museum who graciously adopted the books and artwork at the Museum Society’s second Art and Artifacts Adoption Party on October 11, 2014. Repaired books include Trenton City Directories from 1871, 1880, 1884, 1889, 1893, 1894 and 1896. Artwork that has been framed and can now be displayed include a photograph of “The Whip” ride in Cadwalader Park, a portrait painting of Benjamin Whitmire, and George A. Bradshaw etchings of the Trenton Battle Monument and State and Warren Streets. Artwork whose frames were repaired, thus enabling display, include an etching of the George Washington Bridge under construction, Peggy Peplow Gummere’s drawing of Mount Carmel Guild, a 1927 etching of the Brooklyn Bridge, a lithograph of the 1859 New Jersey Senate, Tom Malloy’s painting of the Trenton Friends Meeting House, and Marguerite Doernbach’s painting of Cadwalader Park. 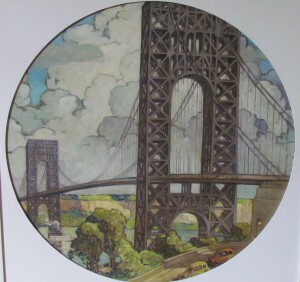 Also on display is a painting of the George Washington Bridge created for the John A. Roebling’s Sons Company exhibit at the 1939 New York World’s Fair, which has been cleaned.